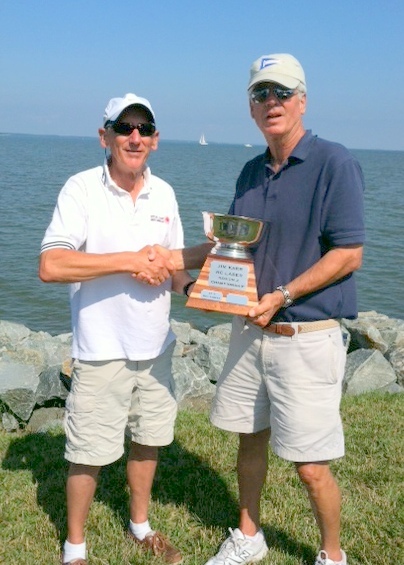 Don Barker, fleet captain from the Oxford RC Laser Fleet, successfully defended his Region 2 Championship at the Tilghman On Chesapeake YC in Tilghman Island, MD. The day opened with light westerly winds and an occasional rain shower. PRO, Peter Bruns gave us a good long line and two lap courses so we fleet raced all 17 boats at once. This was the largest fleet we’ve seen in RC Laser events and we made it work with a very minimum of issues at starts and rounding marks. The fleet was absolutely well behaved and if penalty turns were required they were taken without angst (i.e no outbursts). We are becoming much more responsible skippers, avoiding contact and respecting right of way rules. We sailed five races before the break and Oxford’s Jim Karr, AMYA President, Dave Brawner, and Don Barker in the top there with wins in the first 5 races. Brawner, with an unfortunate 17th in one race, had that to eventually throw out, and looked like the one to beat at the break. After lunch on the deck the sun came out and the predicted southerly showed up. She (the southerly) played with us with occasional holes and a complete shutdown in one race that was abandoned. Don Barker turned it on in the afternoon with clean starts and two more firsts. He was joined by Dave Branning, who recorded a low point afternoon to go from a sixth place in the morning to second overall at the end. Only three points separated 2nd through 5th place. We had one throw out for the 10 races completed. 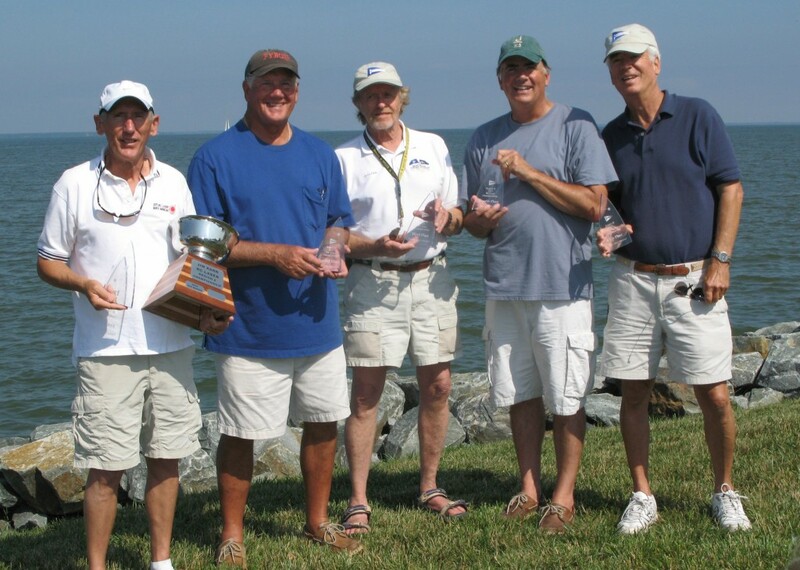 The Oxford guys recorded four of the top five places with Barker, Branning, Roger Vaughan and Jim Karr joined by 4th place winner, Dave Brawner, from West Jersy’s RC Laser Fleet. A big thanks goes to Peter Bruns, our PRO, who did a great job making the right calls in a smooth and calm manner. 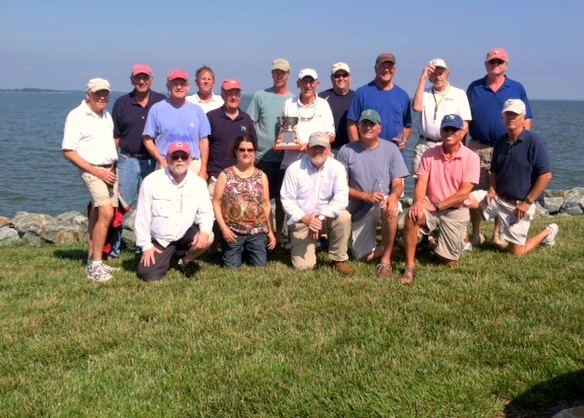 Kudos too to the score keepers of Elaine Hepkin and Claire Barker and to the Oxford Team of John Tochko, Harry Henkel, Roger Baldwin, Roger Vaughan and Don Barker who seem to do whatever it takes to make our fleet and regattas successful. A mention of note is we are the team supporting and hosting the National Championship in October at the Tred Avon YC in October. Thanks too for Rick Ferguson and Tom Rummage who weathered rain and ungodly Bay Bridge traffic to arrive from the Triangle YC in Raleigh, NC for the event. And, as always, the West Jersey guys/gals brought six of their team inlcuding Tammy Brunker sailing her first regatta out of home waters.